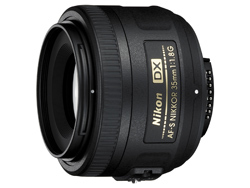 If you’re a Nikon shooter and you’ve been contemplating buying a reasonably priced, professional prime lens, you should give serious consideration to the new NIKKOR AF-S DX 35mm f/1.8G. What makes this lens so special? For less than $200, you get a fast, lightweight, well-made lens that features Nikon’s Silent Wave Motor, so focusing is quick and quiet. The 35mm proved to be a versatile lens. With a minimum focusing distance of 12″, you can get close to flowers or any other subject for detail shots. I also used this lens at a quaint wildlife attraction with good results, especially in the dark reptile exhibit and the underwater viewing area. The 35mm is a fantastic lens for photographing family gatherings. In my experience, a 50mm lens is a bit too long for intimate spaces and sometimes it’s not possible to back up enough to fit everything or everyone in the frame. This isn’t a concern with the 35mm lens. I used it in living rooms, at a restaurant, and on a back porch and never had an issue with the focal length. It’s easier to move a bit closer to frame a shot than to move a wall. The lens is sharp at all f-stops, in all lighting conditions. Color and detail are incredible, and the bokeh is beautiful. I didn’t encounter lens vignetting, even when shooting with the included lens hood and sunlight coming from the side. There was no distortion in the images, and chromatic aberration was reasonably well controlled but did show up in photos with high-to-extreme contrast. It was faint but present. If a wide-angle prime lens is in your future, have a look at the NIKKOR 35mm f/1.8G. You’ll be glad you did. It sounds like a Great lens, I have been looking to get my hands on a different lens…..this one might be it, B&H here I come. I was just thinking of buying a 50mm 1.8 for general use with my Nikon D50. It’s nice to learn about other options.